Little Internet Pvt Ltd, which owns the deals discovery app Little and counts Zovi.com founders Manish Chopra and Satish Mani as promoters, has acquired Chandigarh-based curated deals marketplace Trideal for an undisclosed amount. "Trideal has a large customer base and significant merchant database in Chandigarh. Hence, this acquisition fuels our expansion plans in Punjab," Chopra, CEO and co-founder of Bangalore-based Little, said in a statement. As part of the acquisition, Trideal co-founders and its core team will join Little. Trideal, run by Tri Innovations Pvt Ltd, offers deals across segments such as food and beverages, wellness and entertainment. The marketplace claims to have about 1,000 merchants on its platform. It operates in Chandigarh and Mohali, Punjab, and claims to get about 7,000 visitors for its merchant partners. "Our customers will now get access to Little's merchant and deals database. This will also provide a significant boost in business for our merchants," said Sameer Sharma, CEO and co-founder of Trideal. Little is a mobile marketplace for deals related to offline merchants. It covers restaurants, movies, hotels, salons, gyms, spas and other services. It has more than 8,000 merchants on board who dole out 27,000 live deals on its platform. 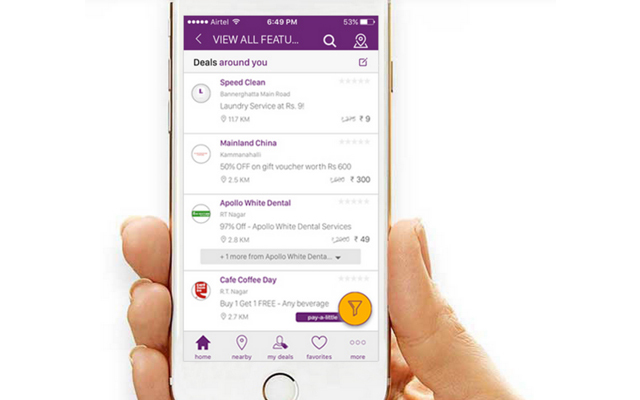 The company hopes to have over 50,000 live deals across 11 cities on its app by March 2016. It expects to hit a gross merchandise value (GMV) facilitation run rate of $170 million (over Rs 1,000 crore) by the end of this year. The deal comes months after Little raised $50 million (Rs 318 crore) in July from One97Communications, which runs mobile commerce venture Paytm, SAIF Partners and Tiger Global Management, among others. As part of the funding, Little will power the deals platform on Paytm. Little's co-founder Satish Mani, a former senior vice-president for technology at Cleartrip, started fashion e-tailer Zovi in 2010 along with Kavindra Mishra and Sartaj Mehta. Zovi started as an online menswear private label brand and added women's wear and accessories later on. On October 8, Little appointed former AirAsia chief commercial officer Amisha Sethi as its chief marketing officer. Last month, Little had appointed Suraj Panigrahy as vice president of sales and merchant acquisition and Wishy Arora as vice president of products.